byzance, originally uploaded by jahansell. We don't have much of a commercial area in town - if I had to guess I'd say we have maybe a dozen retail establishments, including the grocery store, laundromat, pharmacy, 2 wine stores, a flower shop, 3 auto repair shops, 2 hair salons, 3 restaurants, 3 bank branches, the "stove doctor," and 2 clothing and gift shops, of which this is one: Byzance, which imports from India and other interesting places. We also have plenty of professional offices and services- dozens of doctors and dentists, because of Sharon Hospital, as well as lawyers, insurance agents, travel agents landscapers therapists and the like, plus the gym I go to...for such a very small town, come to think of it, we've got a lot of business going on! Over the next few days I'll post a few more of these storefronts. Wish I had the figure for that top in the centre. 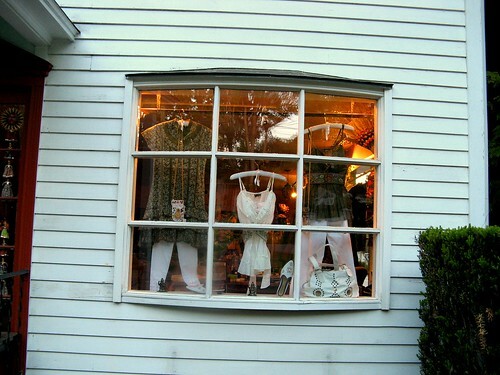 An interesting window display. The narrative makes your town sound about like our town except we have far fewer businesses downtown. It is down to almost none. Today, the final pictures of the series, "A Day in the Life of a Robin," is online. I couldn't decide which picture to use. I hope you get to see them. Nice photo. Three restaurants? I must be missing something. Pappardelle's, The Country Corner and what else? I was counting Little Brick House, the pizza shop! This looks very interesting--Look forward to more pics of your town center!